IMPORTANT: This book is a very niche and specific piece relevant to a small target audience of potential clients of the Affinity business. Please consider whether it is relevant to you before buying it. "In my view, derivatives are financial weapons of mass destruction, carrying dangers that, while now latent, are potentially lethal." - Warren Buffet, Berkshire Hathaway annual report of 2002. 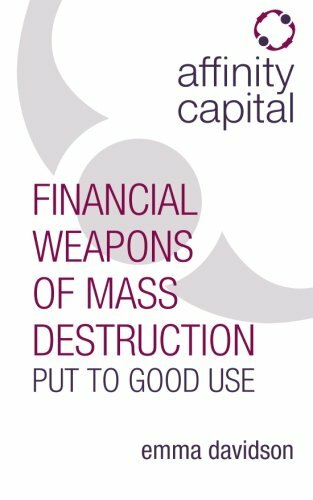 Affinity Capital: Financial Weapons of Mass Destruction put to good use refers to this famous quote and is for a very specific target audience. Emma Davidson, through her extensive experience and knowledge of a niche area within the derivatives world, deals with and uses these WMDs to the advantage of her clients. Affinity Capital introduces us to the author, her values and ethics that have been instilled into her business of the same name. It then focuses on the specific micro-niche of structured investments in which Affinity Capital specialises, and explains why it is absolutely essential for all investors - in particular entrepreneurs, high net-worth individuals, discretionary fund managers and family offices across the globe. As a reference point, minimum investments of this type start at £1 million. Emma Davidson is a structured investments expert with almost 15 years' industry experience. After 12 years of working on some of the world's biggest investment banking trading floors, Emma set up Affinity Capital, an independent investment boutique with access to its own trading models and a track record of trading hundreds of millions in structured investments in under two years. If you have any questions about this product by Rethink Press Limited, contact us by completing and submitting the form below. If you are looking for a specif part number, please include it with your message.